This is the "Stage of Six Summits". Short stage: 97 km. Not one, but TWO pinch points early in a climb. Expect fireworks. Over 4,000 vertical meters of climbing. Last chance saloon for Yates to lock up the GC. Maybe he added a 2 minute headlock on his advantage yesterday, but somehow, I don't think so. It will probably still be a close thing, even if Valverde has fallen off the 2nd step. Three of these summits peak higher than Denver. One is higher than the velodrome at Aquascalientes. So there is some time at altitude, even though the it is not that of the Tour of Utah! What have we got? The route loops and winds back across itself to stay and play in Andorra. The first summit, the Coll de la Comella, we will crest twice today. It is a pretty straightforward cat 2 summit. Some switchbacks, but nice roads, nothing tricky. However, the 2nd summit, the Coll de Beixalis is an entirely different story! As the peloton passes through the town of Encamp, they immediately begin ascending, and the road quickly narrows as it passes by mountain village houses. This is a technical section, and could present a real opportunity for an attack. Some of this climb was gravel recently, but now has probably been paved. This is an ascent that looks built for attacks. The first ascent comes at a mere 12 km into the day, with 84 km remaining. That would normally tell us we would not see an attack, but if there is a team with the desire to gamble? It could be worth a try. This may also be where the break gets free. And if the break has already got a gap, an attack could bridge. The descent off the Beixalis has much better roads, and should be very fast. The middle of the stage, and the longest and highest climb: the Coll de Ordino. But this climb will see little action, I think. It is the longest climb of the day - just under 10 km - but the roads are good roads, without too many switchbacks. There are a few radical switchbacks as they approach the town of Canillo, about halfway between the summit and the foot of the Beixalis (2nd time). Again, another very fast descent, and this could benefit an attacker, as the road is descending all the way back to Encamp, and the foot of the Beixalis climb. Beixalis again, with only 40 km remaining. By then the GC pack will be very select, and there will be little or no advantage from the narrow roads. However, even if we don't see attacks the first run-through, I expect we will see attacks on the 2nd. 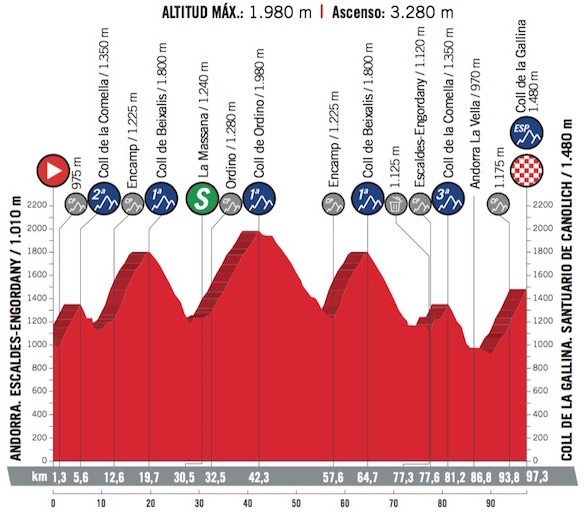 The second time around, if Nibali can crest this summit first, he could solo for the win from here. Only 30 km to go from the summit! Off the Beixalis and south, towards Spain, we hit one of two flattest sections of the day, about 5 km worth of road. Then the Comella again, from the opposite direction, still should be pretty straightforward (unless I missed something), and only 16.5 km remaining. A brief descent, only about 400 m, and the 2nd flat section for the day - all of 8 km. With 3.6 km remaining, they will hit the final climb, the Coll de la Gallina (Chicken Hill in English!) and the race will be won, or lost. If the contenders are together here, as is likely, we will see attacks. The road has plenty of switchbacks, but is not otherwise technical. Given the short length of the climb, a successful attack out of a grupetto will likely come late. Over 4,000 vertical meters of climbing. And Fernando Escartin's intro has the stage distance as 105kms! Maybe that's where the extra 800 meters climbing is! In the lost 7 km! I have a slight whinge about the way today's stage is set up. Great for the inevitable KoM slugfest, but maybe could be better for the GC scuffle? There are about 40kms of climbing overall, but 25kms are covered in the first 40kms of racing. But for the short 3rd cat, there are 25kms of downhill/flat between the summit of the Beixalis and the foot of the final climb. Were it not for this, I would say that the GC tussle was definitely going to kick off on the second ascent of the Beixalis. As it stands, I have a slight concern that they might wait for the final climb. One thing I have no doubt about is that Movistar will throw riders up the road. They are odds on to fail to use them properly. "The best laid schemes o' mice an' men, gang aft a-gley" . . . I agree. Today is a stage for gamblers. A smart team will work their legs off controlling the action, but that is exactly what they will do. Deliver Yates, a la Sky, all pristine and rested, about halfway up that final climb onto the Coll de la Gallina. But I don't think it will be a quiet stage for lack of trying. 1. Astana got the Tactics right focusing on todays stage. 2. MOVIESTAR WILL ATTEMPT TO STEAL AWAY ENRICO MAS, by any means necessary. 3. Nairo might need to take a pay cut. He isn’t the GC threat we all once believed. 4. Michael Woods is a sleeper World Champion pick. How many riders and who do they have to support him?? 5. I always thought Chaves and Aaron Yates would win a GT before Simon. Is Aaron now his brothers lieutenant? Anything is possible it seems, for the Yates triplets. So, a dramatic stage, and Yates honors the drama of the Vuelta by providing some drama of his own. Well done. Now, . An interesting team. I have to observe that this (year) is the first time, in a long time, we've seen a TEAM put tactics on display, and MAKE THEM WORK. Except Sky, of course. Or, to put it more to the point, AGAINST Sky. More noticeably in the Giro, but for sure they were there for this Vuelta. Next year could be very interesting. On another aspect. and . In spite of knowing how to use tactics, they often don't quite seem to get it right. Or they don't have the strength when they do get it right. Which gives more credit, I suppose. #5. Luck of the draw, I'd guess. Adam Simongot the Giro and the Vuelta. Simon Adam got the Tour. 1. Blame it on dyslexia. Or Alzheimer's - I don't know! #5. Luck of the draw, I'd guess. Adam got the Giro and the Vuelta. Simon got the Tour. What's up with Chaves right now? Ouch! Fixed it. Tactics didn't work against Sky? Yeah, you have a point. Maybe I didn't say it well, but it's the first time in years I recall a team showing tactical sense at all. One of my constant complaints with Contador was the continual relative weakness of his teams. I'll have to figure out which stage I'm thinking of, but when AG2R showed cohesive team tactics at the Tour a couple of years ago, it was just so refreshing to watch. Of course, even Movistar display team tactics at times, so you can have tactics, but you still need someone who can finish off the stage. But Mitchelton Scott, at the Giro, demonstrated great team cohesiveness in the first two weeks - well, actually in all 3 weeks. It was nice to watch that part. And I feel like it has been a long time since we've seen a team, other than Sky, do that in the GTs. Quick-Step, though, in the classics and one-days - I'm loving the "One for all and all for one" ethos! I think I read somewhere that he suffers from mononucleosis.